Do you dream of living the artist life of painting the vineyards of Europe but can't afford the trip? Join moi! 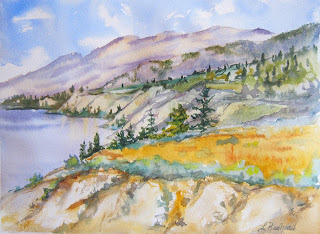 (Leslie Redhead) and Sam Boehner for Art in the Vineyards in Naramata, British Columbia (Canada). 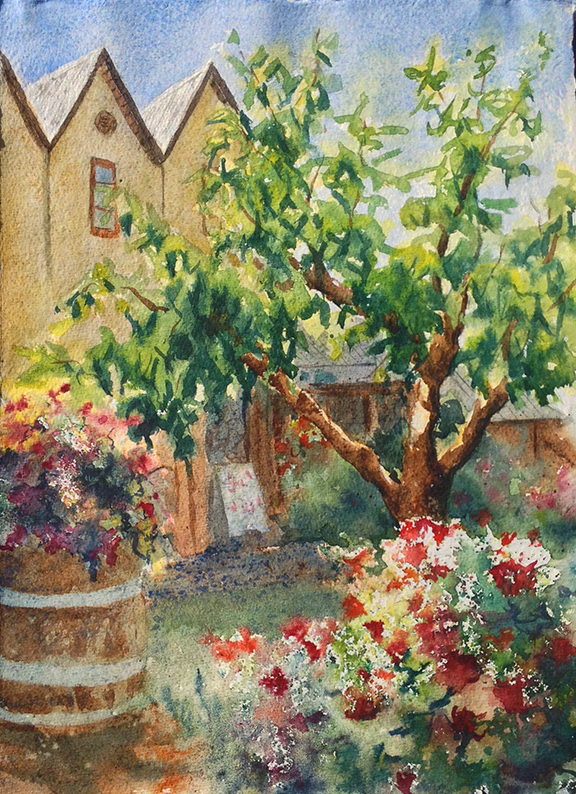 We will be returning to teach watercolor painting in the vineyards of British Columbia's famous wine country this September 14-17, 2015. It is like painting in Europe without the expense. The cost ranges from $330 CAD for the workshop only to $990 CAD for a single occupancy stay, full breakfast every morning, and the workshop. This holiday is filled with many painting opportunities with incredible views and amazing food. This is the third year that we have organized this wonderful painting excursion to the vineyards of the Okanagan. We will be staying at Sandy Beach Lodge and Resort which is located along the shores of Okanagan Lake. 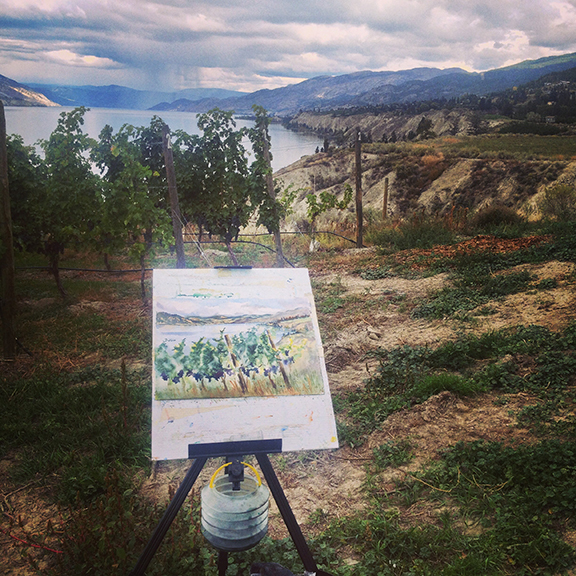 We then spend our mornings painting outdoors in one of the many vineyards located along the Naramata Bench. I will be demonstrating different techniques and tips for painting outdoors and guiding you in your own creations. Following lunch, Sam teaches how to compose and paint a still life with all things wine- from glasses to bottles to grapes. Our painting day ends with a dip in the lake, a quick nap, or a walk about in the village of Naramata followed by dinner at a local winery or restaurant. It is so much fun, you may want to make it a yearly event just like we and many of our students have done. There are only a few spots left so don't delay if you want to be a part of this fantastic opportunity. More information and registration can be found at Islandartescapes.com or email me at leslieredheadart@gmail.com for more information. Hope you can join us this September! This morning I received from photos in my inbox from my friend, Sam Boehner, of me demonstrating at the NWWS Convention. And I wanted to share them with you. Here I am again showing how to move paint around. I had some very willing participants that helped me as well. They did a fabulous job! This photo is of me being like Julia Child. Since I had so little time to demonstrate and the painting takes so long to dry, I had one all ready to pull out from my magic bag. These are the different stages of the painting all lined up and drying. Here I am with some amazing artists. So lucky I was able to hang out with these incredibly talented ladies. Me and the famous Judy Morris standing in front of my painting, Fish Food, that is hung at the Daniel Smith store in Seattle. Last weekend I had the awesome opportunity to demonstrate at the Northwest Watercolor Society's 75th Anniversary Celebration. 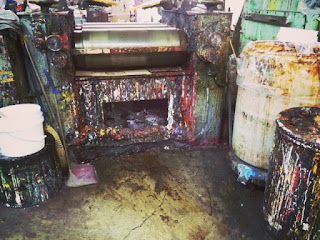 The weekend started with a tour of the Daniel Smith paint factory on Friday night where some of the most wonderful watercolor paint in the world is made. 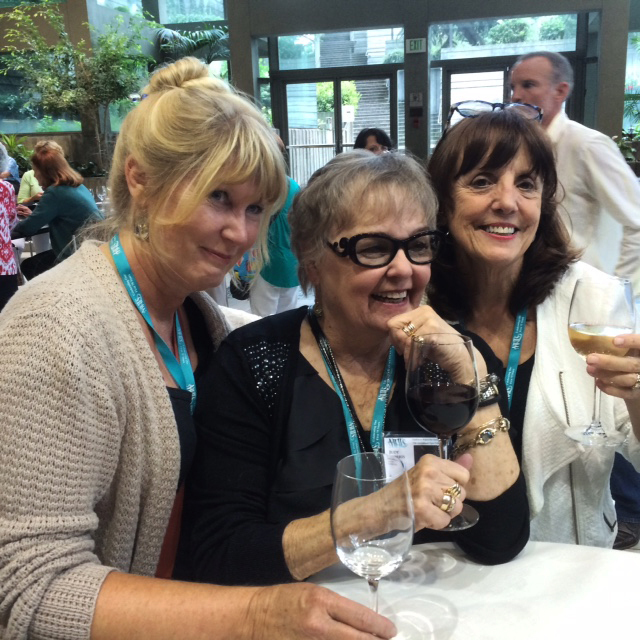 It was exciting to meet the people behind the yummy and beautiful paint and to finally meet the artists and organizers of the Northwest Watercolor Society. I have seen some of their work over the years and have corresponded with others. It is always nice to put a face to the name. And thank you to Daniel Smith for being so generous to let us tour their factory and tell us their story. On Saturday was the big convention with some big name watercolorists, such as Judy Morris, Alvaro Castagnet, Birgit O'Conner, Carla O'Conner, and Catherine Gill. Then there was lil' ol' me. And my name was on the flyer with all these other amazing artists. I had the noon time pouring watercolor demo out on the patio. 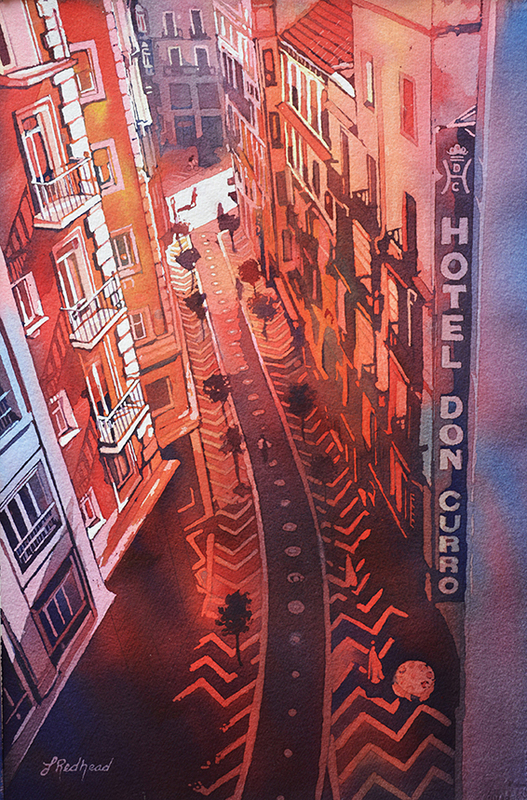 I'm such small potatoes in the world of watercolor so when I was first asked to demonstrate, I thought that I might get 10-20 people popping their heads in to see what it is that I do. To my surprise, my mini-workshop (which also happened to be a hands-on demo) was one of the first to fill with 50 people! I was shocked! And extremely nervous! This was no longer a small deal but a very BIG deal! I spent the week before frantically preparing for the demo and trying to figure out how to make it hands-on with 50 people and 45 minutes. AAAAAAAA! However, I think I was able to figure it out and ended up invited people on stage to help me with the demo. It ended up being a blast! I had someone wet the paper, another person pour, and finally someone tilt the paint into the bucket. I was just the art director guiding these other watercolorists through the process. 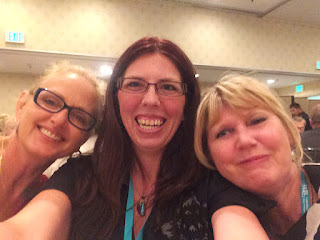 I was able to relax and enjoy myself and the attendees. 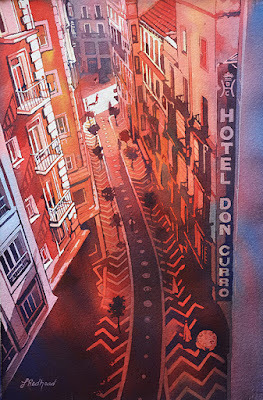 The above painting, Hotel Don Curro, which is in Malaga, Spain, is the finished painting from the demonstration. 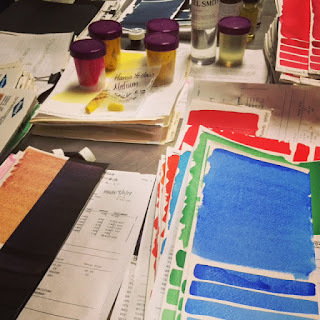 After my time to shine was over with, I was able to attend all the other workshops and learned some new tips and techniques for my own practice. After the convention, there was a reception at the Washington State Convention Centre where the NWWS exhibit and my painting, Splash of Red, was on display. Unfortunately I completely forgot to get my photo taken with my painting! and I don't have any photos of my demonstrating either:( So if you happened to have been there and have a photo of me demonstrating, would you mind sending me a copy? I do feel honored that my painting was chosen to be among so many incredible pieces of art. It was extremely humbling. In fact, the whole experience was humbling to realize what great pieces of art and artists are out there. Finally, we finished off the evening with dinner and awards ceremony at the hotel. The most important thing about the event was that I had fun. I would do it again in a heartbeat and hope that such an event will be held again next year.